Gold is an epitome of luxury, purity and quality and so does the final jewellery come out beautifully looking no less than a marvel. The rich ancient history boasts of Emperors and their Queens magnificently bejewelled in gold ornaments and precious gemstones rich jewellery. That was the time of sheer power! Today, gold jewellery is one of the expensive metal jewellery and certainly quite heavy on the pocket. But women will be women. She is a fine connoisseur of jewellery and certainly she has been head over heels with white gold jewellery. White gold jewellery has become all the rage in the past years and made way in the global market smoothly. The richness of gold and the gorgeous hues of white make up for a stunning piece. At TJC, craftsmanship takes high standards and therefore every piece is curated with immense skill set and technique. From contemporary to classy, chic to stunning, party to formal, the white gold jewellery collection garners a richly infused collection for masses of today’s day and age. Take the brilliant sparkled white gold rings or the dazzling shine that is manifested by white gold earrings, the collection has everything for everyone. White gold bracelets are very well received in the UK market and therefore we have some glamorous pieces to satiate your style index. So, why not ring into another year of your marriage with a delightful token of love? 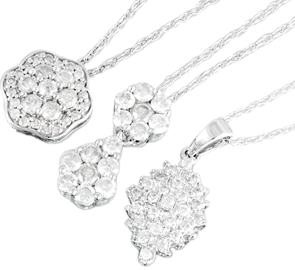 It’s the time to surprise your love with inexpensive finely curated white gold necklaces that speaks of opulence in all its form. We believe you have already added the items of your choice to your cart, if yes, make way for some bling in life!! TJC comes to your rescue and puts forward some inexpensive brilliant designs in jewellery that are up for the grab.